Laboratory and theoretical studies have been made of the effects of ultraviolet photolysis of interstellar grain mantles which consist of combinations of hydrogen, oxygen, carbon and nitrogen — ‘dirty ice’. It is shown that processes involving photolysis (photoprocessing) of interstellar grains are important during most of their lifetime even including the time they spend in dense clouds. A laboratory designed to simulate the interstellar conditions is described. This is the first time such a laboratory has been able to provide results which may be directly scaled to the astrophysical situations involving interstellar grains and their environment. The evolution of grain analogs is followed by observing the infrared absorption spectra of photolyzed samples of ices deposited at 10 K. The creation and storage of radicals and the production of molecules occur as a result of reactions within the solid. A large number of molecules and radicals observed in the interstellar gas appear in the irradiated ices. Energy released during warm-up is seen from visible luminescence and inferred from vapor pressure enhancement which occurs during warming of photolyzed samples relative to unphotolyzed samples. The evolution of a grain and its role as a source as well as a sink of molecules is pictured as a statistical process within dense clouds. The gradual accretion on and photolysis of an individual grain provides the stored chemical energy the release of which is sporadically triggered by relatively mild events (such as low velocity grain-grain collisions) to produce the impulsive heating needed to eject or evaporate a portion of the grain mantle. 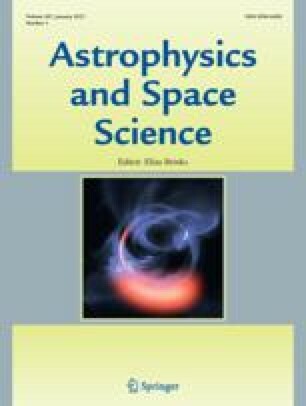 An extremely complex and rather refractory substance possessing the infrared signatures of amino groups and carboxylic acid groups and having a maximum mass of 514 amu has been produced at a rate corresponding to a mass conversion rate of interstellar grains of between 2% and 20% in 107 yr. The shape and position of the astronomically observed 3.1 μm band is duplicated in the laboratory and is shown to be a natural consequence of the processing of grain mantles. Invited contribution to the Proceedings of a Workshop onThermodynamics and Kinetics of Dust Formation in the Space Medium held at the Lunar and Planetary Institute, Houston, 6–8 September, 1978.